Interested in utilizing some of the activities and tools which have emerged from gender-based violence prevention programming from coast to coast? Look no further, and explore examples of conducting needs assessments, workshop planning, and integrating multi-media resources. Adaptation is encouraged to ensure your target participants get the most out of the program. Issue Brief: Engaging Men and Boys to Reduce and Prevent Gender-Based Violence. Status of Women Canada, 2011. Minerson, Todd, H. Carolo, T. Dinner, C. Jones. Fill out the contact form at https://acws.ca/contact-us to learn more about the above tools. 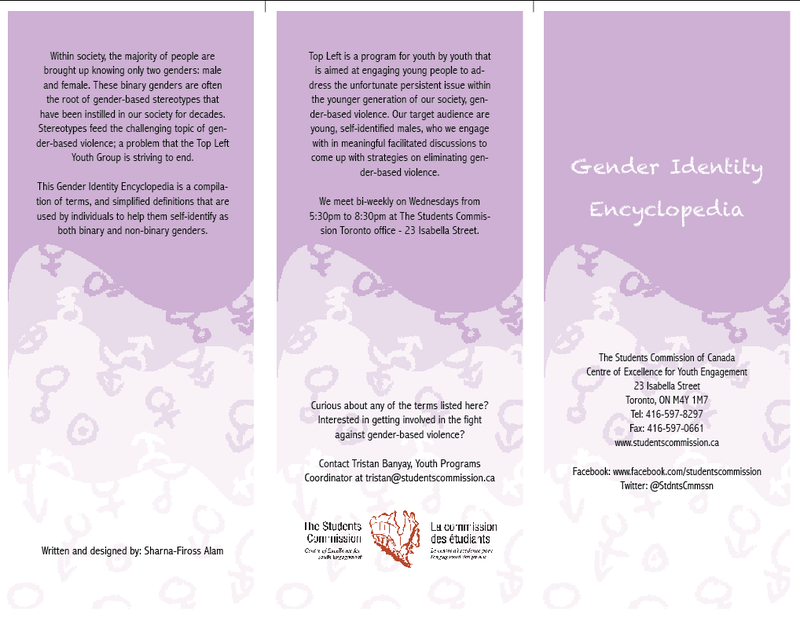 Gender Pamphlet, created by Sharna-Fiross Alam (a member of the Toronto Top Left Youth Group). Top Left Video: What did this program mean to you? Addressing domestic violence in Canadian Muslim Communities – Muslim Resource Centre for Social Support and Integration (MRCSSI). 2010. Where our boys at? Involving young men as allies to end violence against women and girls. Rogers Park Young Women’s Action Team (2010). Virtual Knowledge Center- Engaging Men and Boys (UNIFEM) 2012. Engaging boys to stop violence: A step by step guide for initiating social change (Save the Children Sweden). 2010. Coaching Boys into Men Coaches Kit. Futures Without Violence (2014). He For She: Action Kit. UN Women (2014). Working with men on gender, sexuality, violence and health: Trainers Manual (2005). Engaging with boys and young men to address gender-based violence and masculinities (2011). Rozan. Explore the creative juices of the National CoP partners and White Ribbon to engage men and boys to prevent gender-based violence. Consider if some of these resources will work in your local context, and be inspired. Arts-based and creative approaches can positively impact young people to encourage their gender expression and identity, and exploring positive and supportive roles men and boys can play.